Tash & Adam chose to have their pre-wedding shoot in the Lake District. On the way to the session I got hopelessly lost. I was using Apple maps and lost my signal so the map stuck. I was driving aimlessly on the single lane Lake District roads. My car got scratched on prickly bushes while squeezing past oncoming cars. Fortunately I had left in plenty of time, as I do for all my weddings, so I arrived on time. The adventure was worth it. Tash & Adam got out on the wild, wet and windy hills of Buttermere where they came on holiday years ago. They had been considering getting married here, but the logistics of getting friends and family out to such a remote area proved too much, so they switched the venue to Northside Farm instead. I'll cover their farm wedding in a later blog post. I love getting out into the wild, whatever the weather! And I love exploring new places. 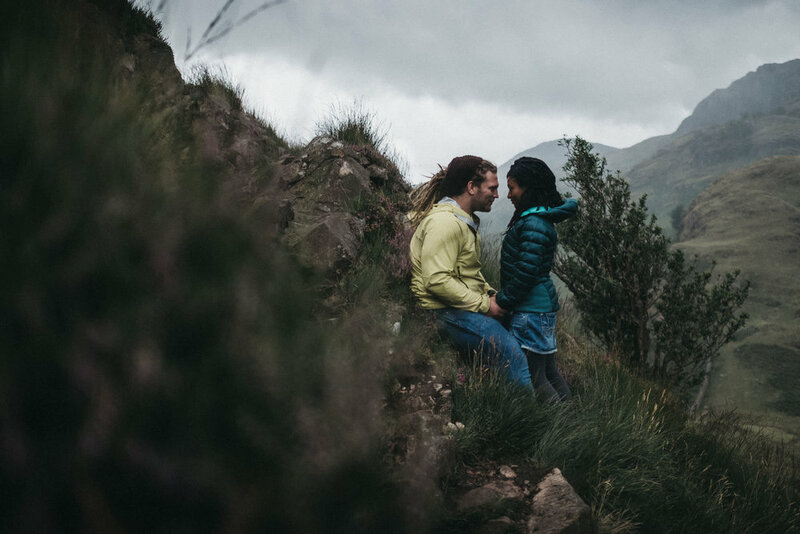 Would you want a photographer who is willing to scramble up a steep fell in foul weather to make pre-wedding photographs that capture the real you? Where would you choose to have your pre-wedding shoot? Leave a comment on this blog as I'm always on the hunt for exciting locations. You can see more of my couples sessions and real weddings on my Lake District weddings page.